Ideal for children from kindergarten through eighth grade. 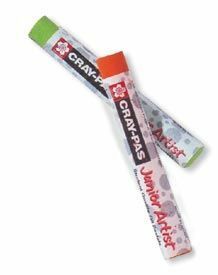 * CP non-toxic by ACMI and ASTM these oil pastels make the creativity process fun easy and safe. * Specially formulated for easy color layering and blending. * Use for drawing sidewalk art scratch art etc. Set includes 12 pastels: Brown White Pale Orange Purple Cobalt Blue Green Yellow Green Yellow Orange Pink Red Black.